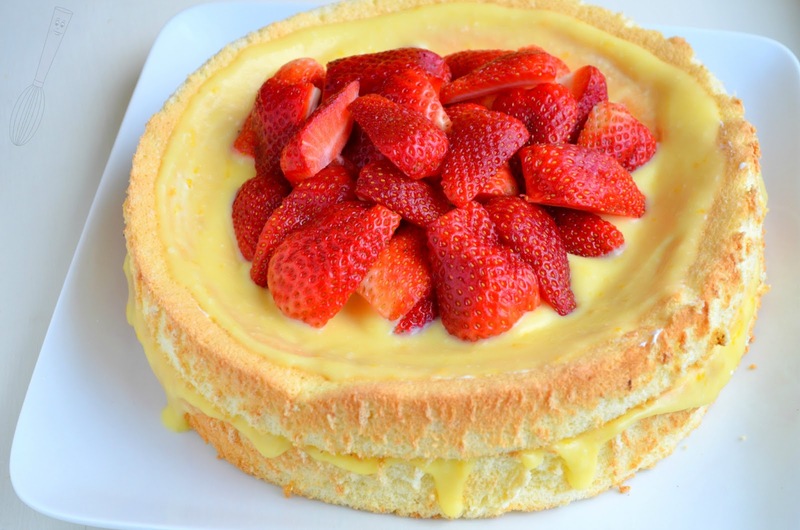 A sponge cake is very similar to an angel food cake to me, light and springy. I do mean springy in the sense of texture and not the season. It doesn't have the snow white color to it because does contain egg yolks. The pans aren't greased, just like an angel food cake, because the cake is so light that it clings to the pan in order to rise. If you grease your pans, you will be sorely disappointed with the flat cake that you pull out of the oven. There is no butter in this cake which is nice because it makes it a little healthier and is part of why the cake is so fluffy when you eat it. A curd of any variety works nicely with this cake because it is also pretty light in texture. 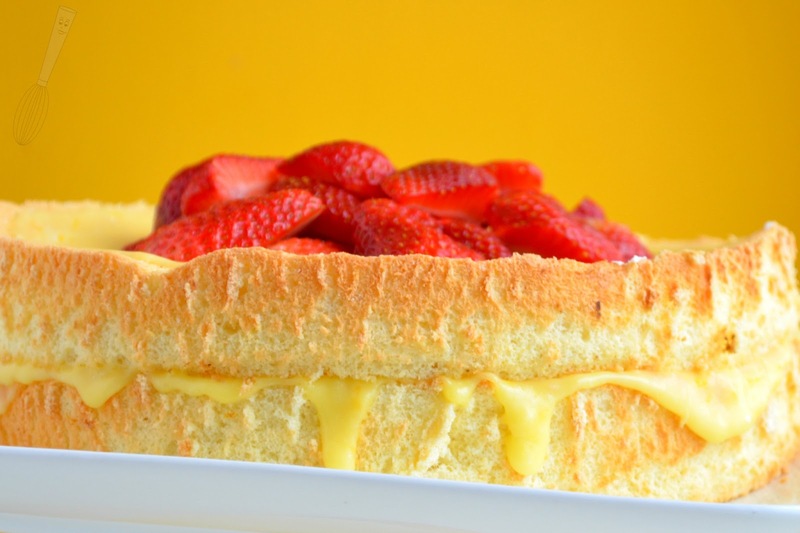 A sponge cake shouldn't be weighed down with heavy ingredients that will overpower it. It should be complemented with light sauces (like a curd) or a coulis. 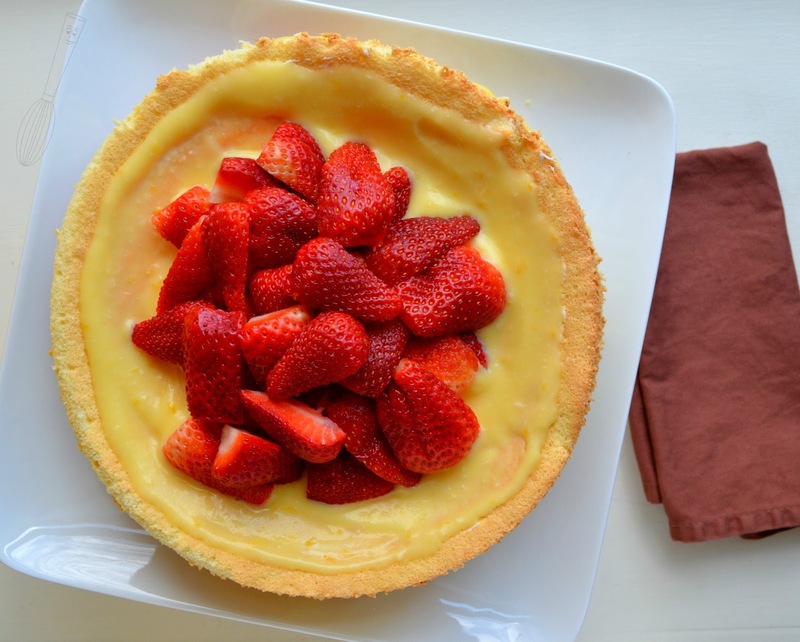 I topped with cake with strawberries because I believe they work well with the orange curd. If you would like to you can also bake this cake in an angel food cake pan for 32-35 minutes or until a toothpick inserted in the center comes out clean. If you like this recipe you may be interested in my angel food cupcakes which are perfect for individual portions. Don't let the long directions scare you, this cake is really easy to make. As always if you have any questions send me an e-mail or leave a comment below. Happy Baking! 1. Make the orange curd: In a small saucepan stir the sugar and juice and heat on medium until simmering. While waiting for the juice to come to a simmer, lightly whisk the eggs in a small bowl. Slowly add about 2 tablespoons of the hot juice mixture to the eggs, whisking constantly to mix. Slowly add the eggs into the juice mixture in the pan, whisking constantly so that the eggs don’t cook. Cook the mixture, whisking constantly, until thickened, 3-4 minutes, remove from heat. Stir in the butter until mixed completely. 2. Strain the orange curd through a fine sieve into a small bowl to smooth it out and get any small pieces of cooked egg out (if there are any). Stir in the orange zest. Store in the refrigerator until thickened, at least 1 hour. 3. Preheat oven to 350F. Bring the eggs to room temperature by separating the whites and yolks in separate bowls, covering with plastic wrap, and letting them sit for about 30 minutes at room temperature. Alternatively, cover the eggs (in their shells) in a bowl with slightly warm water (around 105-115F) and let sit for 5-8 minutes, then separate the yolks and whites into separate bowls. 4. In the clean bowl of a mixer, whip the egg whites until they become foamy, then add the cream of tartar. Whip the egg whites until soft peaks form, then slowly add 1/3 cup granulated sugar a tablespoon at a time while the mixer is running. Whip the egg whites until they are stiff peaks. Pour into a separate bowl (if you only have one bowl for your mixer) and set aside. 5. In a clean mixer bowl beat the egg yolks with the remaining 2/3 cup of sugar until they are fluffy and light, 3-5 minutes on medium speed. Mix in the vanilla, water, and orange zest until blended. 6. Sift the flour, baking powder, and salt over the egg yolk mixture. Using a rubber spatula or a whisk, fold in the flour until it is just combined. Gently fold in 1/3 of the egg whites into the egg yolk mixture being careful not to deflate the batter. Fold in an additional 1/3 of the egg whites until almost mixed but streaks still remain. Carefully fold in the remaining 1/3 of the egg whites until just blended evenly being careful not to over mix the batter. 7. Evenly divide the batter between two ungreased 9” springform pans. Bake the layers for 28-30 minutes or until the edges are lightly browned and a toothpick inserted just off center comes out clean. Remove the cake from the oven and let sit for 10 minutes to cool. Remove from the pans by running a knife around the edges and removing them, then around the bottom of the cake. 8. Place one layer of cake onto a serving platter. Spread half of the orange curd onto the layer making sure it goes to the edges. Place the other layer on the orange curd. Spread the top later with the remaining orange curd then top with fresh strawberries.